Cars that make 428 pound-feet of torque aren’t usually designed for good gas mileage. Smoking the tires? Yes. Saving money at the gas pump? Not so much. This car, though — the Audi A6 TDI — has somehow managed to produce that kind of bullet-train torque while still eking out a 38-mpg highway rating for fuel economy. It’s not like it’s a small, lightweight, save-the-Earth kind of car, either. The A6 is every bit the spacious, solid, sumptuous car you would expect from a top German luxury brand, but it happens to get the same highway rating as a Toyota Corolla. 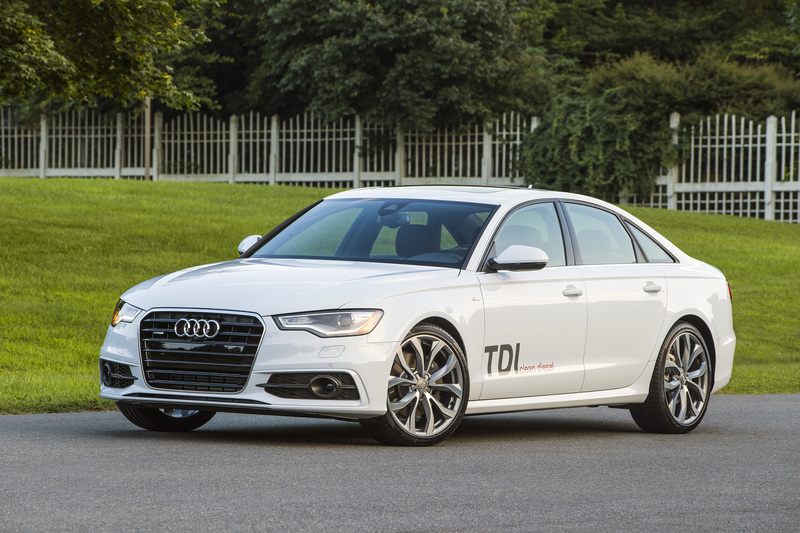 The Audi A6 TDI comes with a powerful diesel engine and is rated for 38 mpg on the highway. It’s the perfect example of how diesel technology is being matured, quieted and cleaned up for the modern age. The TDI’s combination of high torque and low fuel consumption feels like voodoo but is actually the result of some clever engineering under the hood. It uses a 3.0-liter, six-cylinder diesel engine to make all that power, which is enough to launch it from 0-60 mph in 5.5 seconds. Granted, this engine’s 240-horsepower output and 24-mpg city rating don’t make your eyes pop like the torque and highway numbers do. If you do a lot of city driving and tend to leave stoplights with a lead foot, as cars like this beg drivers to do, you won’t be making Prius drivers jealous at the gas station. On the highway, though, this car thoroughly embarrasses hybrids. Not only does it provide extraordinary mileage and range — letting me drive from the Dallas area to Vicksburg, Mississippi and back with just one fuel stop — but also provides a level of luxury and performance that I’ve never experienced before in a car that gets 38 mpg. When you need to pass, the A6 TDI lets you instantly dip into its deep well of torque, and its eight-speed automatic transmission shifts like a cracker, with crisp, buttery gear changes. Audi has managed to eliminate most of the diesel-ness of this engine. There’s very little clackety-clack noise under the hood like you find in diesels of the past, so it sounds mysteriously silent unless you’re stomping on the accelerator. And it’s clean at the tailpipe, without a hint of the belching smoke and nasty smells that diesels made 20 or 30 years ago. To me, this car didn’t drive at all like a diesel. That was a pleasant surprise. 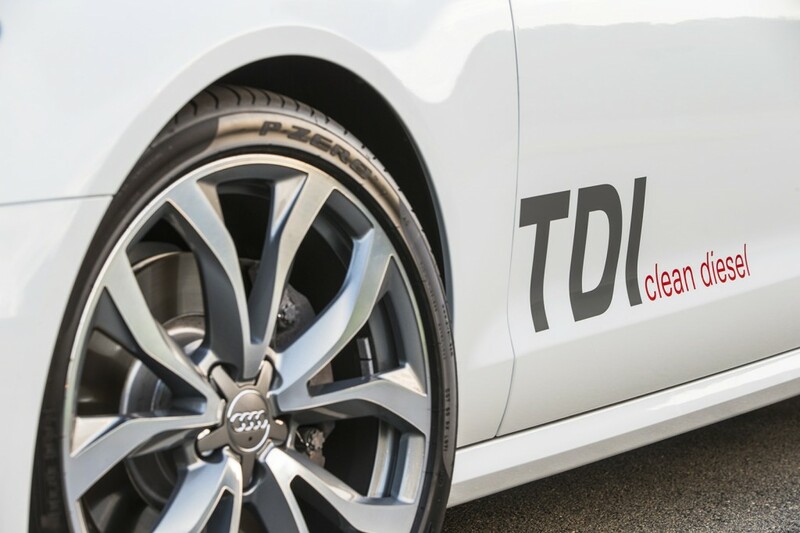 Audi’s test car came with large “TDI clean diesel” lettering on the side to show off its unusual and impressive powertrain. Inside, the cabin has a precise, high-tech feel to it, just as you would expect from a recent Audi, with a definite air of Northern European coolness. Personally, I’ve always liked Old World warmth in luxury cars like you find in so many British models, with their emphasis on dead cows for the leather and dead trees for the dash. But these Audis are so trendy and fresh inside that they make that style of luxury seem very out-of-date. And outside, the A6 makes you look like a Master of the Universe. Audi’s sedans have been the car industry’s hottest trendsetters in the past decade, pioneering the style that other cars will be copying down the road. I think the A6’s body is ever so slightly ahead of its time — futuristic enough to be exciting, yet not so wild as to question its sense of taste. It’s perfectly balanced on the razor’s edge of design, exactly as a great luxury car ought to be. It’s a fashionable, advanced car for people who don’t want to make compromises. Its diesel engine delivers good highway economy and clean, quiet operation.